Bulk Candy Wedding Favors! You can find candy to fill wedding favors boxes and bags in this section. 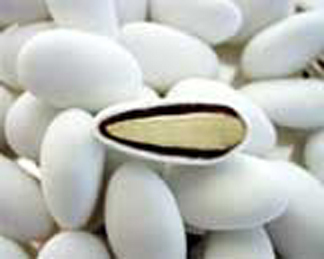 You will also find other special candies that can be used a special favors by just adding a favor tag or personalized ribbon.Confetti Jordan Almonds are the traditional favors for weddings. They are symbolic of the bitterness and sweetness of marriage. Almond jewels are beautiful. 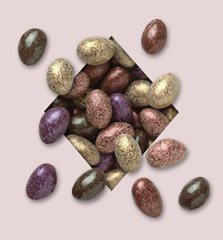 These dark chocolate covered almonds have a metallic, glittery, colorful sugar coating. Price is per 5 pounds of almond jewels. Pareve Kosher certified. These fruit shaped lollipops will be a big hit at your next event. These lollipops are fruit shaped and finished with silk leaf. The orange lollipops are in Pumpkin Pie flavor! 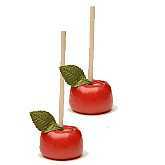 The red apple lollipops have a Cinnamon flavored outer jacket and a Apple flavored center. Tastes just like an Old Fashioned Cinnamon Apple! The green apple lollipops have an outer jacket that is Apple flavored with a caramel flavored center. Tastes just like an Old Fashioned Caramel Apple! Price is per fruit lollipop. Must order in increments of 24. Baby Pacifier Candy This cute baby pacifier candy is perfect for filling favor boxes for baby shower favors or baby announcements. The pacifier candy is fruit flavored. They are sold by the pound. Price is per pound of pacifier candy. Barber Pole Candy - Bulk These Barber Pole Candy Sticks are 10" long! And delicious! They come assorted, cinnamon (red & white), root beer(brown & white), bubble gum(pink & white), strawberry (red & white), tropical punch (pictured), and blueberry(blue & white), or you can purchase the individual flavor/color. Price is per barber pole candy stick. Must order in increments of 32. Bubble Gum Cigars These bubble gum cigars are perfect for the new arrival! You can even have the bubble gum cigars in the maternity ward. 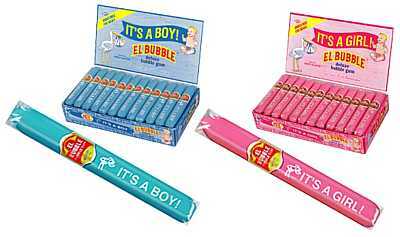 Announce your anticipated or arrived baby with these chewy bubble gum cigars. 36 bubble gum cigars to a box. This candy coal is perfect even if you have nice. This makes a great gift to give to your employees for Christmas! You can imagine the look on their face. 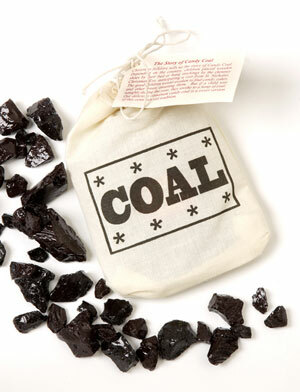 The candy coal also make great party favors and wedding favors. The candy coal is cinnamon flavored. Please note that this candy will turn your mouth and tongue blue. The candy coal is packaged in 5 oz muslin bags. You must order in increments of 16 bags. You are a star couple! This star shaped candy is the perfect filler for your favor holders. The candy stars are perfect for themed events and holiday weddings. Price is per pound of candy stars. Minimum order is 3 pounds. 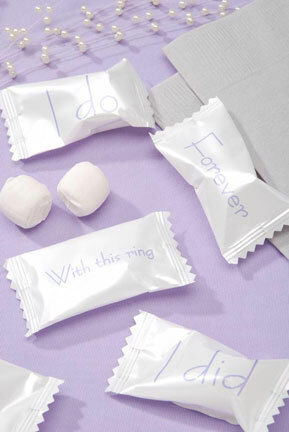 These candy wedding bells are the cutest candy filler for your favor containers. 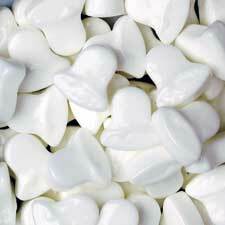 The white wedding bell candies are sweet tart fruit flavored. Price is per 12 oz bag of candy wedding bells. These carnival pops are handmade lollipops shaped like marshmallows. 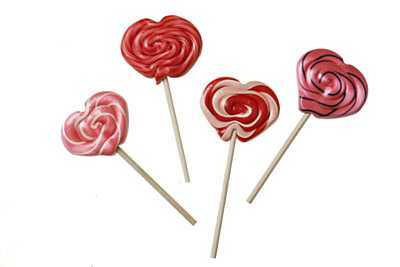 These carnival lollipops make great favors for weddings and parties. They have been featured on The Martha Stewart show and in some of her publications. The price is per pack of 25. 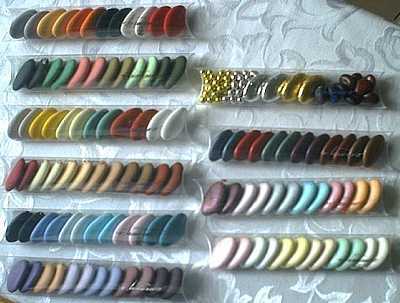 If you want a specific color, you will have to order in increments of 100 or 250. 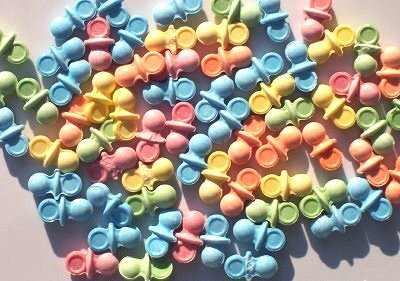 If you order in any other quantities, the carnival pops will be assorted, regardless if you choose a specific color. 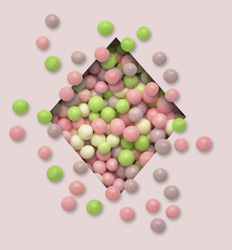 of the sugarbonnen, please put the different colors in the comment field below. Only 1 color per box. Price is per box of sugarbonen. 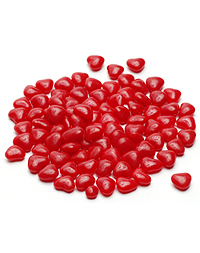 Cinnamon Hearts Here's a new way to add some kick and share the love at your reception. These red-hot cinnamon hearts will bring a hit of color to your reception tables -- and guests will love the refreshing treat of cinnamon heart candy. Fill Clear-Top Favor Tins (each holds about 90 cinnamon hearts) for a memorable take-home favor. 1-lb bag contains approximately 1300 cinnamon heart candies. Clear-top Favor Tins sold separately. Price is per pound of cinnamon hearts. Circus Sticks - Hard Candy Sticks These candy sticks or circus sticks are great to use to make favors or just to add color to tables or even just a sweet diversion. To make the circus stick favors seen in Martha Stewart Weddings, use 4 circus sticks, grogain ribbon, and 9" glassine bags. Price is per candy stick favor. Must order in increments of 96 circus sticks. Each measures ~8". Assorted will consist of top 6 selling flavors. It will vary. Circus Sticks - Personalized Candy Holder Sleeves Provide stick candy treats in these elegant folded sleeves. Inside are slots for holding the candy. The 7" x 1 3/4" sleeves wrap around the candy and secure with a cutout heart closure. Your first names and the thank you verse are printed in the lettering style shown and your choice of ink color. Since these are wraps, the candy sticks will need to be secured with a tie or glue dots, which are not included. 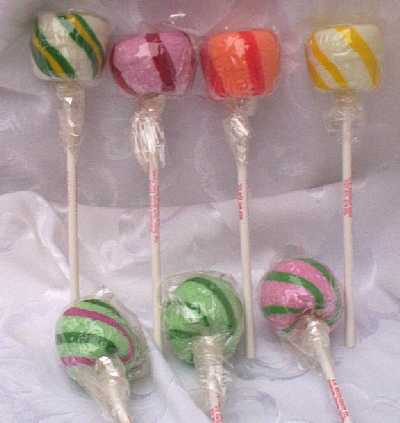 We have a great selection of gourmet circus candy sticks in our favors-candy section. Price is for a set of 50 sleeves Put first names in the comment section below. 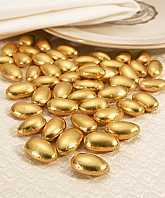 Confetti Jordan Almonds - Silver or Gold Foil Wrapped Dragees Jordan Almonds are a traditional wedding favor. They symbolize marriage, sweetness and bitterness. Usually 5 Jordan almonds per box or bag. The 5 represents health, wealth, longevity, fertility, and happiness. These Jordan almonds are sold by the pound. There are ~30 - 40 Jordan almonds per bag. Price is per 7 oz bag. 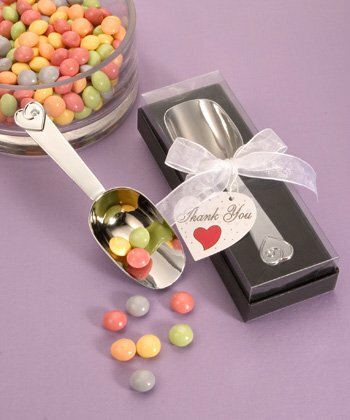 Perfect choice for candy wedding favors. Fish Shaped Candy These cute and colorful candy fish are fruit flavored. 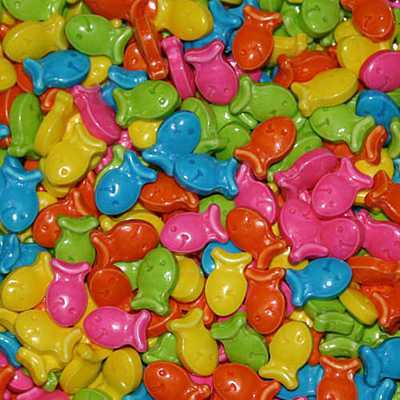 These candy fish are perfect for your beach, tropical or pool themed event. Combine them with our seashell candy and pebble candy to create a more dramatic effect! Your guests will love these fish candies! They are assorted colors. Each fish candy measures about 1/4" There are ~470 fish per pound. Price is per pound. Minimum order is 3 pounds. These tiny french mint pearls are a long time favorite for wedding and party favors fillers. 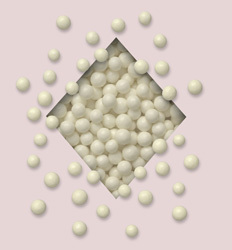 Price is per 5 pounds of tiny french mint pearls. Parve Kosher certified. These unique mints are golf ball mints. The little dimpled round mints are peppermints. They are so perfect for golf themed wedding favors. 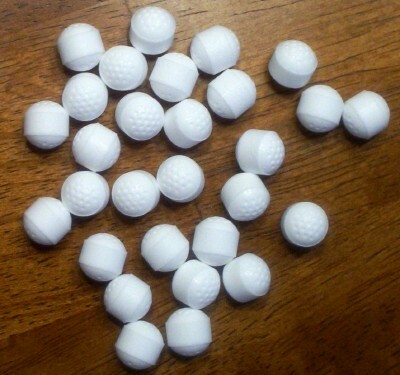 Each golf ball mint is ~.33"D Use the golf ball mints to fill favor boxes or bags. Price is per pound of golf ball mints. Heart Shaped Mints Heart shaped cinnamints and heart shaped peppermints? Yes, you can now buy them in bulk. Use these heart shaped cinnamon mints and heart shaped peppermints to fill favor bags and boxes to make a really cute heart themed favor. 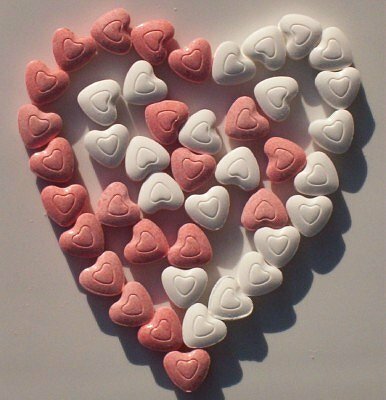 They look really cute when you combine them with our heart shaped cinnamon candies. They are sold by the pound. The heart shaped cinnamints are pink and the heart shaped peppermints are all white. ~650 pieces per pound. Price is per pound. These assorted wedding words buttermints are a great way to celebrate your wedding. The wedding buttermints are individually wrapped. There are 50 individually wrapped wedding buttermints per set. Price is per set of 50. 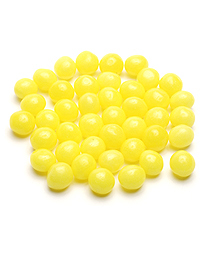 Lemon pearls are tiny lemon flavored yellow balls. They are delicious are make great candy fillers. 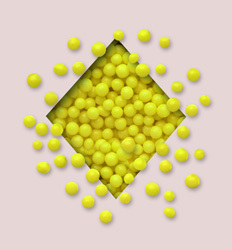 Price is per 5 pounds of lemon pearls. Parve Kosher certified. This category has a total of 57 products divided in 28 per page.